Stockholm 2012: Swedish designers Form Us With Love present five new projects at the Swedish Museum of Architecture as part of Stockholm Design Week this week. The work on show includes their Bento chair for new brand One Nordic Furniture Company (see our story here) pendant lamps for Design House Stockholm, dividers for Swedish brand Abstracta, a lamp for Swedish firm Ateljé Lyktan and vases for Spanish company Cosentino Silestone. 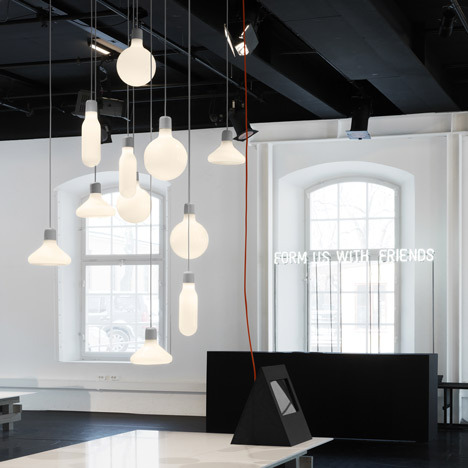 Stockholm Design Week continues until 12 February. See all our coverage here. Photos are by Jonas Lindström. For the third year in a row, Form Us With Love presents the exhibition concept Form Us With Friends during Stockholm Design Week. This year, Form Us With Love has teamed up with the centre for architecture, form and design, The Swedish Museum of Architecture and created a unique exhibition on the scenic island of Skeppsholmen in central Stockholm. With the exhibition, Form Us With Love wants to highlight the creative collaborations behind their new work. A year of intense work has resulted in five projects adding new dimensions to each specific area: lighting, furniture and objects. The exhibition focuses on the story and process behind the projects. Form Us With Love presents new design for five friends: the Plaid dividers for Abstracta (Sweden), the Plug Lamp for Ateljé Lyktan (Sweden), the Form Pendants for Design House Stockholm (Sweden), the Bento chair & table for One Nordic Furniture Company (Finland) and the Slab Vases for Cosentino Silestone (Spain).